Without a doubt, ﻿my cross-stitch quilt, Thanks to Vesta, was my favorite finish of December! After taking pretty much the whole year to make enough blocks from scraps, it was a complete pleasure to finally bring them all together in a cohesive design. Quilting a fast and fun cross-hatch serpentine and then finishing with a made-from-binding-scraps binding kept me motivated till the last stitch. And then last night - after the mosaic was made and all - I finished 1 more Dala horse pillow, yet another gift. From beginning to end, it was a pretty good month! And every project finished with skill and creativity! I am planning on making some of those Dala horses and snowflakes! Although not strictly appropriate for an Australian Christmas, I can see myself tackling these come June and July! You never fail to inspire - what a great set of finishes! Happy New Year! beautiful finishes! a great year for you! I had a grandma that taught me how to crochet around hankies. I thought that was fantastic! I also have a cherished crazy quilt block (with embroidery) of her's that was randomly thrown in a box of "stuff" as my aunts divided up the leftovers of her belongings when she passed on. That was many years before I took up quilting. I often wondered why I held onto that. Now I'm so glad I did. Thanks to Vesta is really special. Whenever I see cross stitched dresser cloths at the thrift store I rescue them with plans to repurpose those too damaged. The pp pillows are perfect holiday gifts. Wow, what a beautiful month. I really love your quilt, and all the smaller things are really lovely too. Wow, you've had a productive month! Everything is beautiful, but I'm especially drawn to your cross-stitch quilt, it's stunning! You finished the second dala horse, and she's beautiful!!! 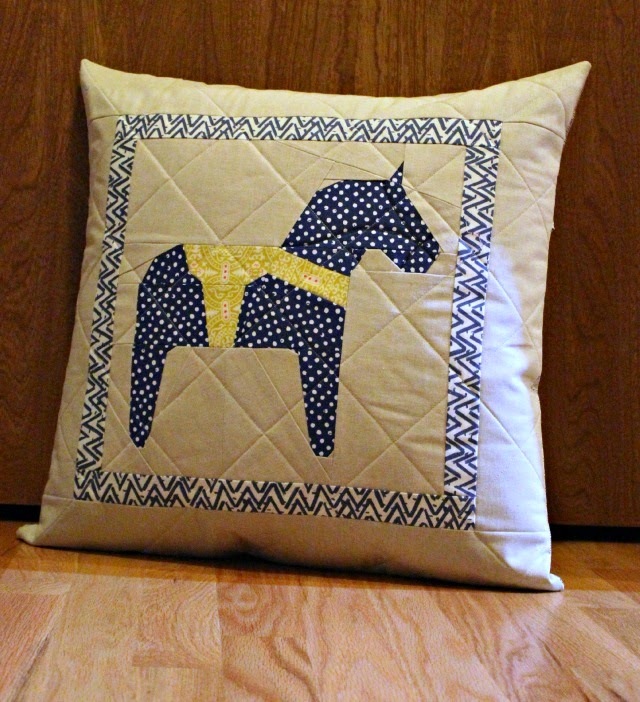 My horse is done, but not yet quilted or in pillow form. What a great pattern though, I loved making it! It was indeed a very good month! So many beautiful projects! Happy New Year Debbie! Congratulations on a fabulously creative year!!! Love the cross-stitch quilt. The horse pillow is a darling too. A great month, it's fun seeing all those lovely gifts!